The entertainment awards season is upon us. Next in line is, Zee Cine Awards 2019. The ceremony to felicitate the best of the best in the business this year, was held in Mumbai today. The audience was in for a big treat when it came to performances at the awards show. 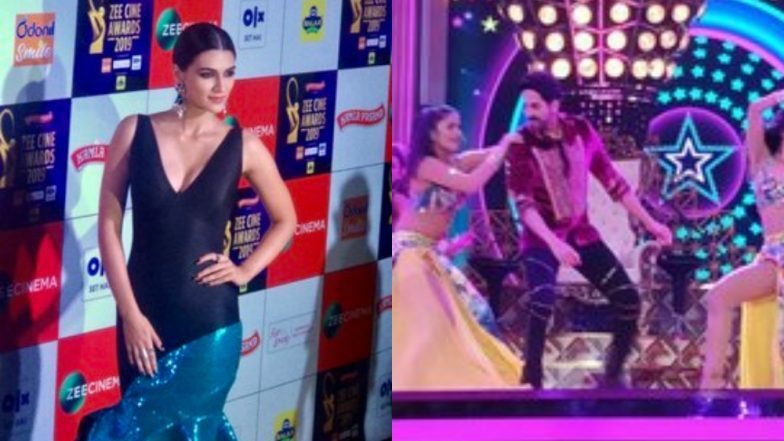 Ayushmann Khurrana, Kriti Sanon, Madhuri Dixit were only some of the celebs who danced their hearts out on the stage. The video clipping of their performances made their way online and quickly went viral. The internet was joyous to see Madhuri dance on the songs from Hum Aapke Hain Koun. A perfect tribute. Ayushmann and Kriti also danced to the beats of their songs. Kriti rocked a solo performance on the song, Coca Cola Tu, from her movie, Luka Chuppi. Where is Kartik Aaryan at? Ayushmann loves dancing and it shows. He took us back to his Dum Laga Ke Haisha days with his adorable Dard Karara performance. Zee Cine Awards were hosted by the dashing duo - Kartik Aaryan and Vicky Kaushal. Aren't we glad that Bollywood took a break from giving anchoring responsibilities from Kapil Sharma and Karan Johar and even Maniesh Paul? The biggest awards of the night were bagged by Janhvi Kapoor, Ishaan Khatter, expectedly. Katrina Kaif won the award for Best Supporting Actress and we feel it was about time. Her performance in the Aanand L Rai film, Zero, surely deserved one. This is her first Zee Cine Award for a movie performance. Vicky Kaushal won the award for Best Supporting Actor.